The RnineT has a very nice appeal, but looks more for show than for use. Richard, there might be a reason why most long distance travellers chose Beemers, however if/when those bikes fail, the fix is never easy, and doesn't come cheap. I believe that a mechanically clean machine will take you around the world, no matter what brand or year (exhibit A: Mike and his Ruckus), and yes, it will break down eventually. The questions being, how easy will it be to fix it, and how much will it cost. Now that I am venturing out on a 12 year old cruiser to explore East Canada, I have the same thoughts and worries, plus I have no knowledge or talent to repair stuff myself. I just trust that the bike won't fail me, and if so, that a Samaritan or a shop is close enough to help. You're right, the perfect bike doesn't exist. Though I believe that this Ural had more problems than I would have expected. I continue to be amazed at how few problems that Mike S has had with his Ruckus though the breakdowns he has had meant for some long delays due to the limited parts availability. Indeed anything can break. I didn't consider who owned your Ural before, but agree with not knowing how it was used or taken care of. Because you and Dom chronicle your breakdowns it is easy to think Urals aren't trustworthy. On the ADV form there is a huge file on why not to buy a Ural and just as many defenders as complaints. In the end we ride until it breaks, we fix it, we ride, we fix, and when the cost of repairs outweigh the pleasure we get we look for a new/different one. Ahhhhhh, the life of a motorcyclist. That long thread on ADVrider was one of the things that convinced me to get a Ural. And, you are absolutely right, we ride, we fix, and ride again. I love my Ural rig but it surely is a love/hate relationship at times. SonjaM nailed it, there is no perfect motorcycle. Your comments as to not knowing a motorcycle's prior treatment and history are dead on as well. Even new rigs though, come with issues. It's the nature of motorcycle ownership, and I see nothing in the horizon (within my parameters and financial expenditure limitations) that is better than a Ural rig. I empathize with your uncertainty. All isn't necessarily good with Airhead Beemers. Fifth gear use causes early failure of one of the transmission bearings due to end loads from the helical cut gears. Without the sidecar it isn't a problem. Also, the first gear on the Ural is much lower so the Beemer needs more clutch slipping to get moving. I still think that the Ural fits my needs pretty well. Especially if I want to continue riding during the winter. Occasionally, I think about the BMW engine in a Ural as a good combination. Not for more speed or power but for reliability. Especially since I believe the engine is the Urals weakest point. As to the Ural having a lower first gear, sad. If I end up keeping Scarlett past her warranty period, might entertain putting Brigitta's engine or so me other airhead's engine in Scarlett 's chassis though I believe you lose reverse. I wasn't aware of it until George mentioned it. He said to avoid 5th unless very lightly loaded such as downhill with a tailwind. The R80 supposedly has a lower final drive ratio which would help with starts. According to what I read, the Ural transmission is retained so you get to keep reverse. If you want to use the BMW transmission, you also need the BMW final drive due to the rotational direction of the transmission output. (5 speeds in reverse?). Ha-haa! That'd be a one-of-a-kind collector's item right there. Tuning in to others’ lengthy moto-journeys (your recent Uraling adventure and the adventures of Stephanie Yue, Mike Saunders, and so, so many others) is not only entertaining and inspiring, but enlightening concerning the capabilities of these bikes and rigs: Let’s be honest, when folks think of scooters, they don’t usually visualize camping geared-up cross-country plus tours, but it seems to be working, and fairly well. Earlier this year I was browsing a moto-magazine, and I came across an ad for Motoped’s Survival bike. Needless to say, I’ve since been dreaming about taking a longer adventure on such a machine (it doesn’t help that the business next door is now building these up for sale). Granted, through populated areas one would have to take the back roads of the back roads, but hey, that’s where the best stuff is anyway. I was looking at the Motoped bike earlier in the year. It looks pretty nice. Mike is travelling very light. Much lighter than most people would be willing to do. But he has been to some incredible places. He's a great example to those who are waiting to get the "perfect dual sport bike" before venturing to Alaska. And those that carry everything including the kitchen sink for a trip along a road system. 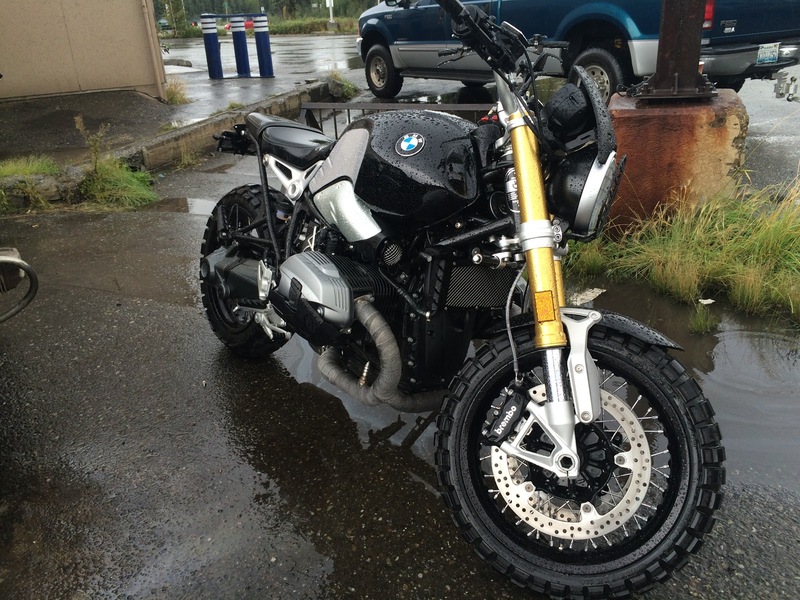 That is an interesting rendition of the RnineT, not sure how functional it would be off road. As far as bike reliability and suitability, they vary with owners. Even the same machine with different owners will have different issues and be suited for different types of riding. Hopefully your Ural's prior issues have all been fixed and it will be smooth cruising now. 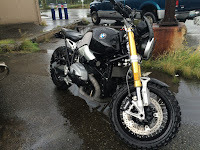 I don''t think functionality was really important on the RnineT though it would be a great ride on most of the gravel roads in AK. I'm hoping that the problems have been addressed. It seems to be running great now. Now that the Ural is as good as new, I'm sure with the right care it will perform well for quite some time. That's kind of what I'm hoping for. Regular wear and tear and maintenance is fine. I suspect that the next thing to need attention may be the clutch and possibly the u-joint next to the final drive. The other 2 were replaced. The headset bearings probably need grease but shouldn't need replacement. After all 40k km is not that much. "Riding in very cold temperatures like I did last winter is probably outside of the design envelope as well but now that I no longer have a commute, that may not happen very often. At least one can hope." Very funny. I predict it will still be going out in the cold weather. Remember your daily commute to College Coffee House? I'm going to have to agree with VStar Lady, since it is as good as new right now, with the right care it will probably go a long way. I really don't believe the cold is will affect it that much with the right preparations to the bike. After reading this back and forth how lucky I've been by not buying someone else's problems. There still is a cold related item. I had the problem as did Bruce W in Ketchikan when he rode to Fairbanks last January. The engine breather port would freeze when riding for an extended period of time in temperatures below 0°F. This builds up pressure inside the engine which could blow oil seals. You are lucky to be the only owner!